I have been part of iCamp Europaean 6th Framework project pedagogical workpackage team from 2006. In this project we conducted three trials of teaching with web 2.0 tools in cross-institutional settings. Our final pedagogical deliverable provides the new model how to support self-directing, collaborating and networking competences with new media environments in institutional settings. 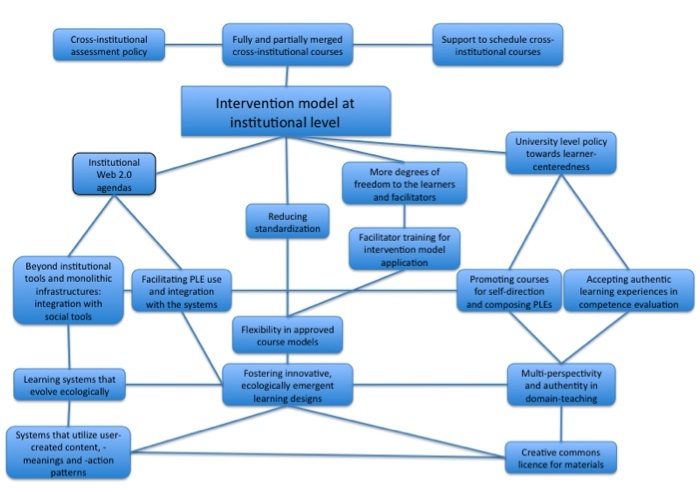 In the application of an intervention model, facilitators and students have a crucial role in changing institutionally accepted practices. This year Ed-media 2008 conference takes place in Vienna. Although i am not able to be at EdMedia this year, since i go to iCalt conference, i really regret since there will be a very interesting community meeting. 3. Stéphane Sire et al. Abstract: Although it is not yet common practice, the use of personal learning environments (PLEs) has started to enter formal higher education by a number of early adopters. Some lecturers facilitate their students in making use of social software tools and networked resources for learning activities. In our contribution observations from field research that has been conducted in the context of the European research project iCamp are discussed. On a conceptual level iCamp intends to develop a learning environment design model that provides more autonomy to the learner, in terms of activities tools and resources. In the field trials students were guided towards self-reflection and self-direction activities by making use of their personal learning environments, while at the same time they were prompted to perform collaborative activities in distributed shared learning environments. Thus students and facilitators were challenged by the competitive nature of self-reflection done in single PLEs against the other-directed reflective activities done in distributed shared learning environments. This article elaborates on why collaborative activities might be hindering the individual reflective activities, and how this can be overcome. Besides symposium, we have another paper where we elaborate the self-directing aspects in social learning environment using the data from the master course of web 2.0 from Tallinn University. Tammets, K., Väljataga, T., & Pata, K. (2008). Self-directing at social spaces: conceptual framework for course design. Proceedings of Ed-Media 2008. Vienna: AACE, 2008. Abstract: This paper examines the use of social spaces in order to foster self-directed learning activities in higher educational institutions. It argues that current instructional design models need to be adjusted with respect to self-direction according to the continuously changing processes in post-industrial society. Based on empirical research conducted with master students it attempts to design a conceptual framework for course design with the emphasis on self-direction in social spaces. Finally we have managed to analyse some data related to learning affordances of aggregators and weblogs. The study was conducted as part of the master-level Educational Technology course at Tallinn University in spring term 2007. We analysed students‘ visual schemes of personal learning landscapes and activity patterns, and the written explanations containing information about the learning affordances of social software. Affordances were collected from the schemes and initially categorised according to the tools they were related to. Each particular affordance could be listed only once in relation to the certain tool. Next, the second order categorization of affordances according to the activity pattern types was undertaken. The base of the activity types emerged from the analysis of different students‘ activity patterns in combination of tools‘ use. The list of 9 pedagogical activity types was developed. The following figure demonstrates the different types of learning affordances related blogs and aggregators. The main affordances of weblogs that could be categorized as supporting the activities related to assembling the learning environment were: personalization of web-pages, adding and saving data and links, limiting the access rights, and information facilitation. One of the students mentioned the affordance of relating weblogs with other mediating environment, indicating that indeed such affordances are perceived, which are evoked by the interrelations of certain tools, not only by one tool. Some students perceived that they can do a prognosis of certain resources and evaluate the usage of different tools in weblog. Students did not mention any weblog affordances related community formation activity. This is quite an interesting result, since it is generally believed that weblogs might be a good tool for social networking. It is assumed that the course designs should try to initiate more such activities using new social software functions. Besides community formation, running the community as a creative system is becoming increasingly important. The most frequent affordances that could be related as supporting the lecturing and presenting activity type were giving tasks and presenting information to the learners. The fact that students could see this pedagogical task-related affordance is promising for the educators who would like to use weblogs primarily as the teaching tools. Some student, however, generalized this affordance and did not mention task-specific actions – affordances what they perceived as creating information and publishing artifacts are the most general function commonly related to the weblogs. Only one affordance was classified as supporting the information filtering activity type: understanding the information given by the tutor. However, this affordance still indicates towards cognitive information filtering, rather than information retrieval by using various technical features social software offers. The weblogs have several ways of filtering information by tags, keywords, incoming RSS feeds, tag-feeds. From the perspective of course design, it can be concluded that the facilitators need to plan more activities where students could actively try out how to use such social information retrieval methods. A number of activities could be classified as supporting the self-tutoring activity type. Affordances such as learning, self-study, self-reflection, self-analyzis, and self-evaluation were perceived as part of weblog functionalities. This indicates that weblogs might be used actively in education for self-directed learning. Other affordances students mentioned were creating time-tables and action plans and doing homework. Student found several affordances that could be classified as supporting the activities related to individual creative assignments. These, that could be related with one student’s learning activities were: getting tasks, browsing thematic information and analyzing information feeds, reading, reflecting on artifacts in the weblog, revising information, presenting, and improving. However, there was high number of affordances, which presumed the interaction with other student’s work, such as commenting the posts, sharing files and giving feedback to peer’s work. This indicates that the the paradigm change is about to happen in what is considered an individual work – commenting and sharing each others’ assignments during the activity shifts the emphasis from the outcome-related assignments, where students must produce a final artifact only, towards increased attention to the learning process in which students develop and dynamically change their knowledge. A group of affordances were classified as supporting the collaborative creative assignments. Monitoring the other learners and the community reflection, communication with the co-learners and the tutor, sharing and interchange of information with learners, collecting the results from the group activity and coordinating the information among the group of learners were most frequently mentioned affordances. However, it was evident that students did not yet perceive the possibilities social software allowed to do collaborative creative assignments, such as mashing feeds, retrieving information using tags or social browsing etc. Co-construction of knowledge was not perceived as part of the social software affordances. A small group of affordances were classified as supporting the assessment and evaluation type of activities. These were evaluation of learners knew knowledge, getting feedback and learning from the result of group activities. Notable is that the last two are related to what students can gain from assessment activities. The students were not able of bringing out many different affordances social software might offer for evaluation. This indicates that in the new social-software based course designs the facilitators should develop a bigger variety of assessment methods that originate from the functions social software offers. It is important that assessment and evaluation procedures were used for increasing students’ motivation to learn, and were not merely seen as grading instruments. A group of affordances were classified as enhancing regulation, monitoring and support activities. Affordances related to the facilitator were monitoring learner’s action and reflection, supervising learners, giving feedback and supporting, recognizing students and giving enthusiasm. Affordance related to the student’s activity was asking the teacher. The majority of learning affordances students related with aggregator belonged to three types of activities: assembling the learning environment, filtering information, and regulation, monitoring and support. Activity of assembling the learning environment with the aggregator is favored by the following affordances: creating an aggregator, aggregating personal interest feeds, collaboratively monitoring co-learners blogs, getting feedback and sharing the blog content. Since the aggregator was one of the central tools in the course environment, where students could monitor each other’s weblog feeds and initiate writing feedback, this was influencing strongly students’ perception of aggregators. However, students have not payed much attention to the mashed bookmark feed and bookmark tagcloud which were also accessible from aggregation page. Students noted once the affordance of discussion as supporting community-formation activities with the aggregator. The widgets supporting asynchronous and synchronous discussions were part of the group aggregator. The only affordance supporting lecturing and presenting activity was publishing feeds. The affordances enhancing information filtering type of activities were: aggregating social tags feeds/artifacts’ information, collecting friends’/community feeds, creating personal filtering for the feeds, monitoring community reflection. Notable is that while some learners perceived information as feeds, the others named it artifacts or information. It may be assumed that this represents two types of thinking: technological (feeds, tags) and information-related (artifacts, blog posts, info). This aspect may be important if aggregators are taught to be used as personal or group learning tools. The affordances related to the aggregator express very clearly students new type of technological understanding of social software – the words feed, social tag, aggregation, and filtering appeared in most of the affordances of this group. Another interesting issue is other-directedness if thinking of the aggregators. Aggregators have commonly introduced as personal tools, while in this master course it was used as a group tool. Thus students perceived mainly the affordances related to monitoring and filtering information from other students and from the community and did not describe the widgets that might be used for mashing personal information. Affordances belonging to the self-tutoring activity type were missing. Individual creative assignments were supported by the few affordances like collecting information, reading feeds and selecting information. Collaborative creative assignments were supported mainly by the affordances of collaborative monitoring the feeds or co-learners. Again the two distinctive perceptions – technological (feed) and learner-related ( co-learner, student, user) can be found when expressing the affordances. Assessment-related affordances were evaluating feeds and getting feedback. Similarly to weblog affordances for learning, learners see two aspects of evaluation – that of the facilitator who does the evaluation and the other where student benefits from the evaluation. From the perspective of using aggregators in teaching, it is clear that there needs to be developed a new method how to assess students’ personal or group aggregators as their information gateways and activity areas. Affordances of aggregators related to regulation, monitoring and support type of activities were: getting the instructions, monitoring co-learners or students’ feeds/learners/artifacts, aggregating feeds, sharing personal feeds, and giving feedback to the feed. 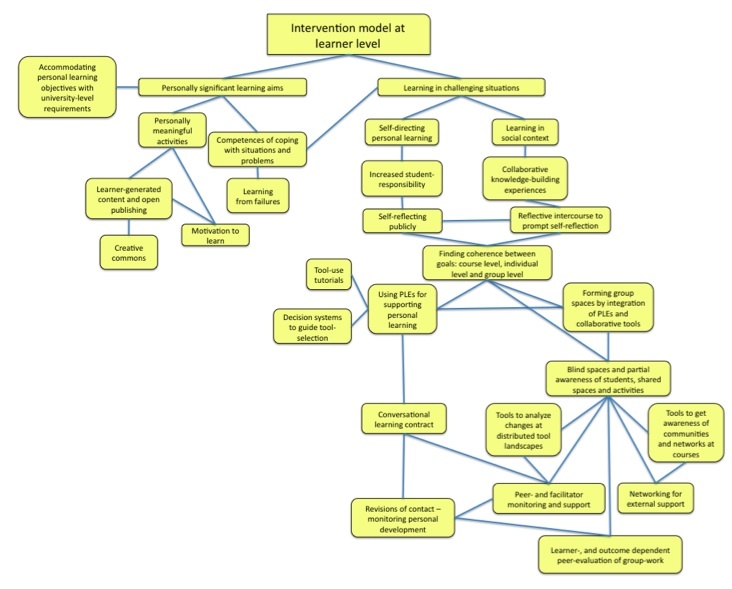 Interesting was that students named affordances similarly in relation to teacher’s as well as students’ regulation, monitoring and support activities. This indicates that in new type of courses the learning situation is diminishing the difference between the facilitator’s and learners’ roles. Here are just some of the new habits and principles i have experienced within a year as a scientist. The process of making knowledge becomes more important than the final product, even to the extent that there is no final product in the end, but we are always on the road. It is more and more evident, that the public ideas are found much more frequently than those in journals, and in the world scale they have more impact and chance to be considered. We are not infallible as scientists, thus, we must stop pretending that all we are never wrong. We can, and always should turn back in the middle of the path, and say we were mistaken and start new path. There are journals who try to use after-reflection for final papers, for keeping their community more lively. It is supposed to give opportunities to create knowledge in another format than evaluating the paper in new journal papers with critical or supportive references. However, mixing the two formats – ‘end product centred’ and ‘process centred’ seems not very fertile in those journal weblogs. The community has the means and right to ground and contribute to the ideas publicly. The ownership of the ideas is collaborative. We as scientists need to dissolve in the masses for the sake of the product we develop. When all the knowledge is accepted as dynamic, and the process of creating knowledge is most important, scientists need places for ‘ brain poking and tickling’ as playgrounds, where knowledge was always flowing between individuals and getting variated. We don’t want to be deadly serious all the time. No wonder many conferences are accompanied by social practices such as lively micro-blogging, or using shared tags to blog and deposit side-products (images, comments, summaries, reflections). The validation of the ideas becomes public and democratic, demolishing the myth that few selected reviewers can give more objective review. It is evident that journal reviews are built upon the concept of final, objective knowledge. We, as scientists, should stop believing that there is final, objective truth in scientific ideas and accept that the process of constantly changing and playing with the knowledge is, what we are ought to do. Thousand Plateaus by Deleuze & Guattari, 1987) is supported by new formats better than ever. Already now, there are too many journals to follow their final ‘end product papers’, so we need to start using social web practices – social bookmarking, aggregating rss feeds from journal paper keywords to filter and become aware what is out there and be effective.